Tabakh naat is made on special ceremonies and functions. It is usually served with pulao. It may also be served as a snack. 1. 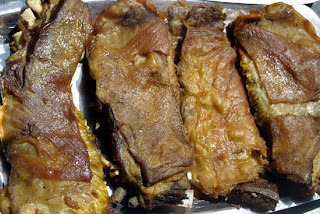 1kg lamb mutton (rib pieces). 2. ½ table spoon haldi powder (turmeric powder). 3. 1 table spoon saunf powder (fennel powder). 4. 1 table spoon salt. 5. 1 table spoon zeera powder (cumin powder). 6. ¼ tea spoon hing (asafetida). 7. 2 half crushed moti elaichi (black cardamom). 8. 2 crushed elaichi (cardamom). 9. 2 tej patta (bay leaves). 10. 2 half crushed laung (cloves). 12. 3 ladles pure ghee. 13. 1’x1’white malmal cloth (very thin cotton cloth). 1. Wash the mutton, put it in a big patila along with one glass of water. 2. Wash the malmal cloth so as to remove starch and dirt if any. 3. Put haldi, saunf, salt, zeera powder, hing, crushed moti elaichi, laung and elaichi in the cloth and make a knot in such a way so that all the ingredients lie inside it and soak it in the patila. 4. Cover and start boiling it on a full flame and add tej patta also. 5. After 5 minutes add one glass of milk and boil till it is tender and all the liquid disappears. 6. Remove the patila and put a frying pan on the medium flame. 7. Add three ladles of pure ghee in pan and start frying the pieces (three-four at a time) till the colour changes brown. 8. Tabakh naat is ready, serve it hot.